There’s always a moment when a little bit more torque would be handy, like when there’s a tourist trundling along at 20mph and you need to get by, or when there’s a large truck bearing down on you and you need to get off the slip road onto the motorway. 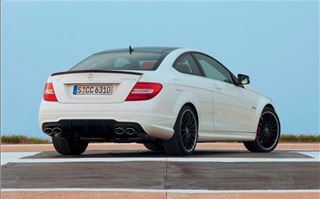 On these occasions that extra ‘go’ is very useful, which is probably why Mercedes-Benz decided that the £56,665 C63 AMG Coupe should be fitted with a 457bhp 6.2-litre V8, which produces 600Nm of torque. 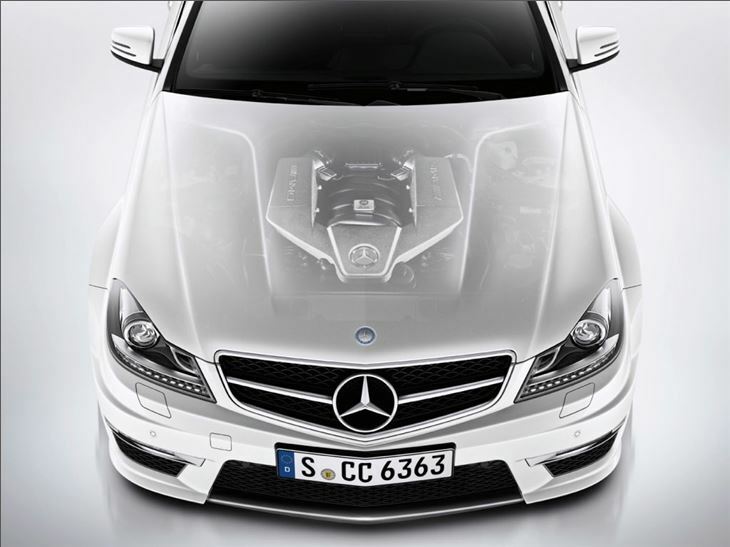 The engine is, of course, the most important aspect of this car. Already available in the C63 saloon and estate, the AMG tuned unit overflows with character. 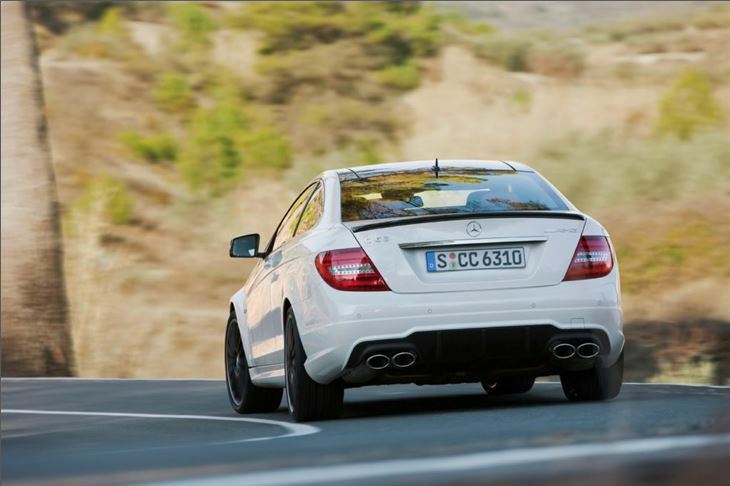 Start the car and it barks at you before settling into a throbbing, low, bass-laden rumble. When on the move at low speeds the C63 Coupe is very easy to drive, thanks to fairly light steering and a seven-speed automatic gearbox. This AMG SPEEDSHIFT MCT-7 gearbox has a wet start-off clutch rather than a traditional torque-convertor, which improves fuel economy and reduces shift time. 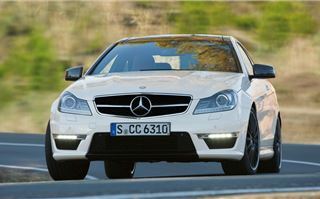 It’s comfy too, with the same interior as the rest of the C-Coupe range, albeit with more supportive but still well-trimmed seats. It’s noticeably firmer than the rest of the range, making speed-bumps and potholes a little bit awkward, although not terribly harsh. The suspension is a three-link front and multilink independent rear set-up, obviously aimed at performance rather than comfort. 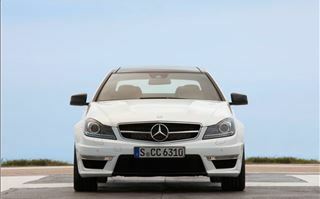 The brakes can be a little grabby at low speeds, but at higher speeds they’re responsive and linear, inspiring confidence. That’s pretty handy when there’s so much power available. 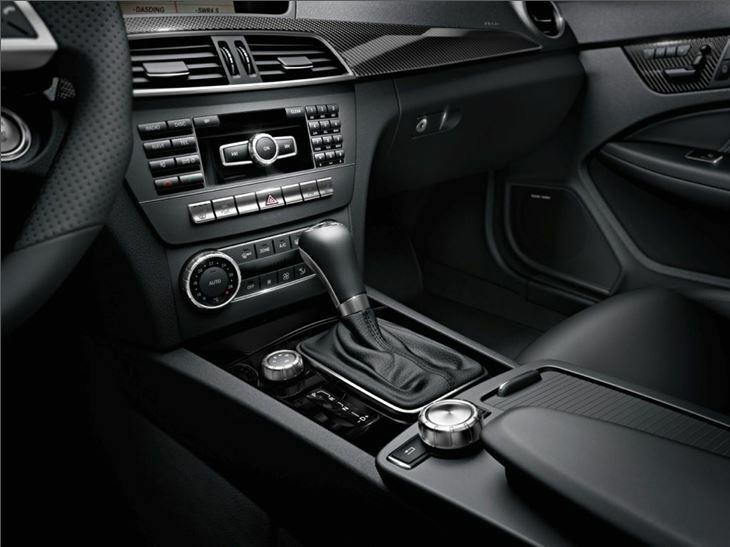 The gearbox has four settings – C, S, S+ and M. The C mode is designed for comfort and efficiency, with earlier up shifts and a softer throttle response. It may well be that Mercedes-Benz wants to improve efficiency, but don’t expect too much: the official combined cycle figure is a measly 23.5mpg. 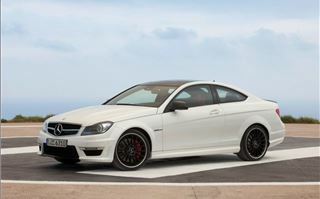 But if you’re considering the C63 Coupe there’s very little chance you’ll be bothered about running costs. That’s especially good news when you get out on the open road, because in S, S+ and M modes the gearbox doesn’t care much about fuel economy, changing up as late as it can and burning extra fuel on the overrun just to make more of that wonderful noise. At high revs the V8 engine makes an utterly intoxicating sound. 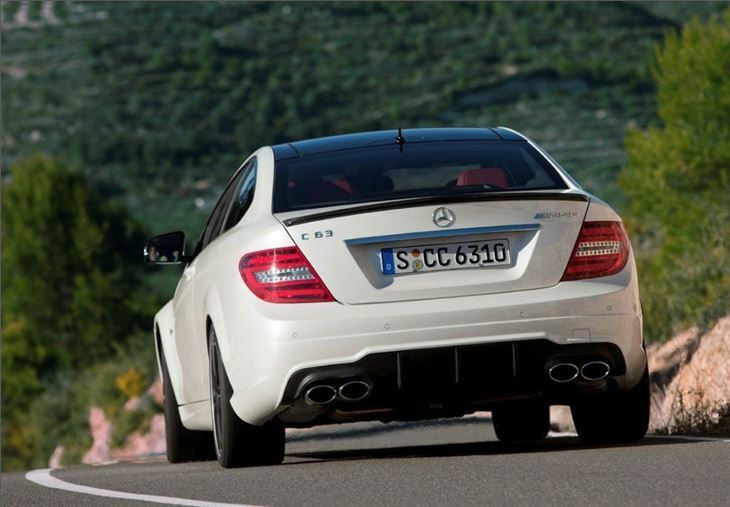 It’s a brutal, raw growl and on downshifts the exhaust ignites lumps of fuel with an addictive crack. Even on a straight road this car is brilliant fun and many smiles could be had by simply slowing down and speeding up again. 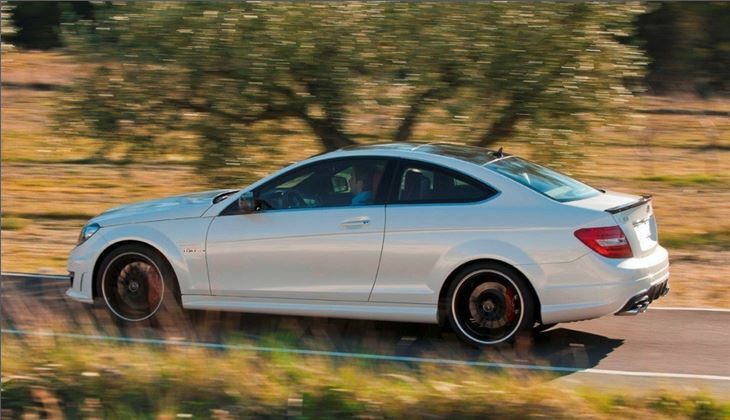 On a public road the C63 Coupe can go around bends at the kind of speeds that’ll have you banned from driving quite quickly and providing you’re not a thug with the throttle it’ll be facing the right way when it comes out of the other side of them. 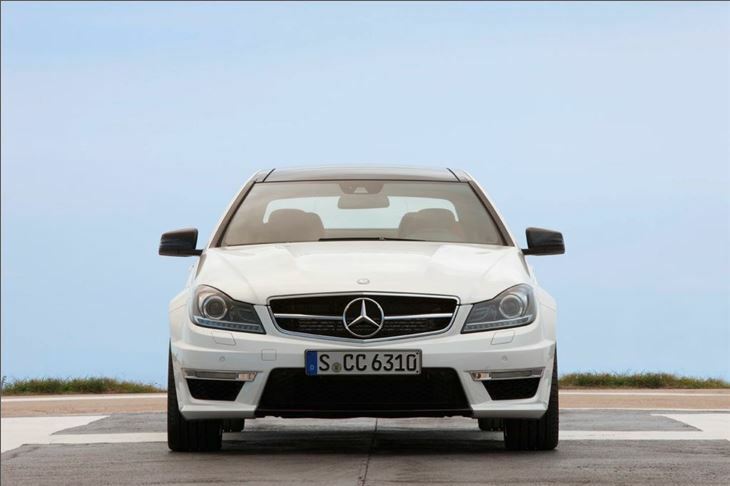 The chunky, leather trimmed wheel adequately relays what the front wheels are doing. However, with such a large engine at the front of an already weighty body, a degree of manhandling is required to get what is essentially a rather heavy beast to dance like a racing car. It’s no Lotus Elise. 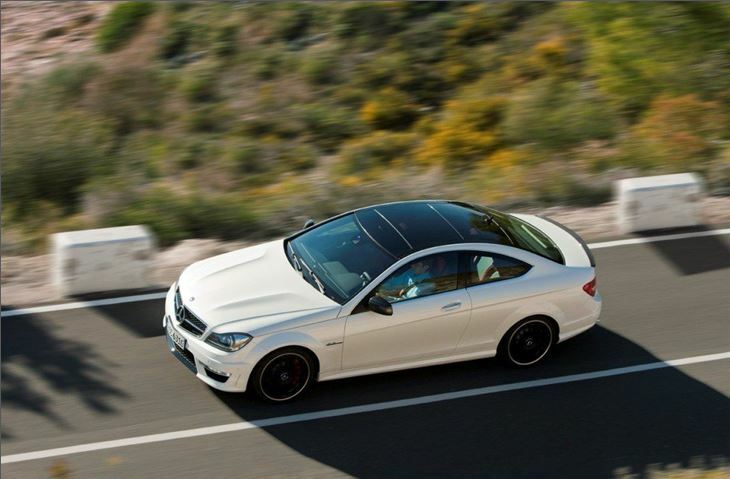 Take it to a race track and chances are that the Audi RS5 and BMW M3 would record faster lap times. 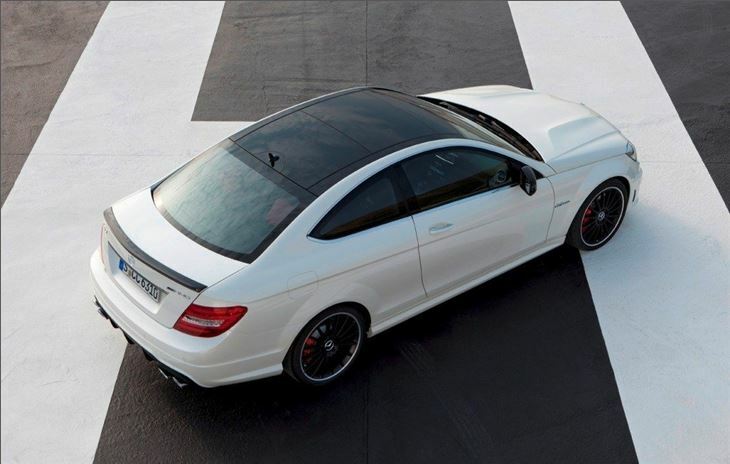 But in the C63 Coupe you’d be having more fun. Roll on the throttle a little too early and the rear end will, without doubt, step out of line. At the hands of professional DTM driver Susie Stoddart we were given a demo lap of Circuito Monteblanco and every corner was like a Hollywood chase scene, complete with screeching tyres, smoke, and V8 soundtrack. An optional rear differential-lock is available, too, along with a performance package that ups power to 487bhp – something the majority of buyers are expected to choose. 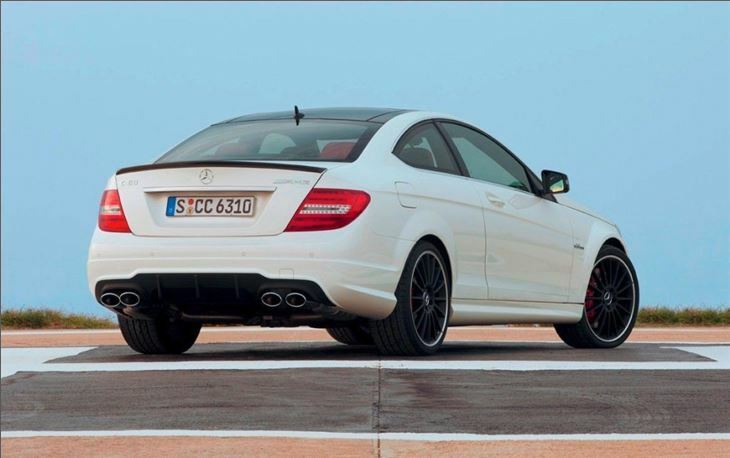 The C63 Coupe is, when all said and done, a big, hilarious toy. It’s not a track day time-setter, it’s not a sensible mode of day-to-day transport. It’s a big, thirsty, loud plaything. The design brief clearly listed fun as the highest priority.